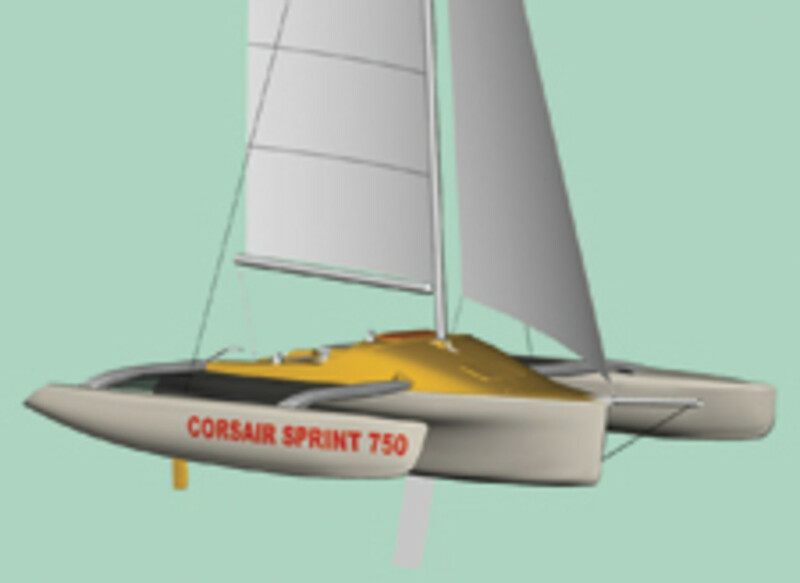 The new Corsair Sprint 750 represents a high-octane evolution of the successful Corsair 24. Its length and overall profile are similar to the 24’s, but over 100 pounds have been trimmed from the hull and the cockpit has been lengthened at the expense of some interior volume in the cuddy cabin. The cabin has a small double bunk and a place to put an optional porta-potty, but accommodations space is secondary to the Sprinter’s drag-racing speed potential. This trimaran is part of a rare breed of boats that can be easily trailered (the outer hulls fold up to a street-legal 8 feet, 2 inches), easily rigged (the mast can be winched up with a gin pole), and then sailed at speeds over 20 knots. One-design and PHRF racers will surely be attracted to its performance potential, but the Sprint may also be changing the definition of a pocket cruiser.